“Our mission is to build bags that last a lifetime…” That’s the core sentiment of TCHOUP Industries, a craft bag making company centered in New Orleans. The company produces backpacks, shoulder bags, fanny packs, messenger bags, and all kinds of other pack and luggage wear. Every product is durable, yet stylish, and can be worn to the office just as easily as a camping trip. Patti Dunn, owner and founder of TCHOUP Industries, knows a thing or two about creating high-quality bags. She was raised in North Carolina amidst a thriving textile industry, but as she grew older, many of those jobs disappeared overseas. Ms. Dunn is now committed to sourcing materials locally and producing her products close to home in Louisiana. In fact, every TCHOUP Industries bag has a hang tag with a map that shows you where all the materials came from. And now, TCHOUP has a shop. Located in a burgeoning section of the Lower Garden District (near Hi-Volt, Half Moon, and The Saint), TCHOUP Industries shares a space with another local bag making company, DVRA, and the record store Disko Obscura. The spacious shop has a modern sensibility with large windows that allow for great light all day, as well as easy-to-navigate bag and record displays. In the back, TCHOUP employees work sewing machines to create each product, giving the place an intimate, almost farm-to-table air. 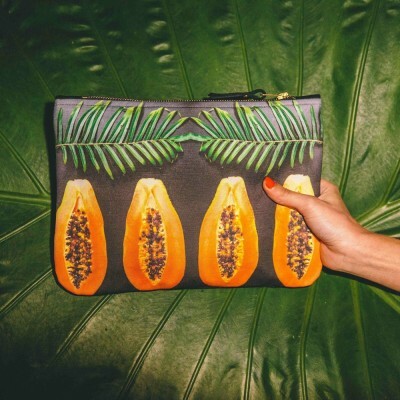 DVRA, another third of the shop, makes bags and pouches inspired by the tropical vegetation of Louisiana, the Caribbean and Latin America. The company’s founder, Kathi Keppel, has a particular fondness for papayas, as evidenced by DVRA’s popular Black Papaya Pouch. Perhaps the most unique aspect of the shared space is that it doubles (triples?) as a record store. Joey Buttons, co-founder of the Disko Obscura label, has DJ’d for several years down the street at The Saint. He’d wanted to open a record shop for years, but didn’t know if he could do it all on his own. Last year though, when the space in the LGD became available, all three entrepreneurs jumped at the opportunity. The TCHOUP/DVRA/Disko Obscura shop is located at 113B St. Mary St in the Lower Garden District. Above: a special peek at what the shop has to offer. Main image courtesy of TCHOUP Industries.